I realized about a month ago that I was spending the majority of my life at the grocery store. I was shopping every day – coming up with last minute ideas for dinner and then frantically running to the store around 5pm to gather ingredients. It was stressful all around and I was spending around $30-$40 a day to make dinner. Enter into my life meal planning. I have seen meal planning posts on Pinterests and finally decided to see what it was all about. 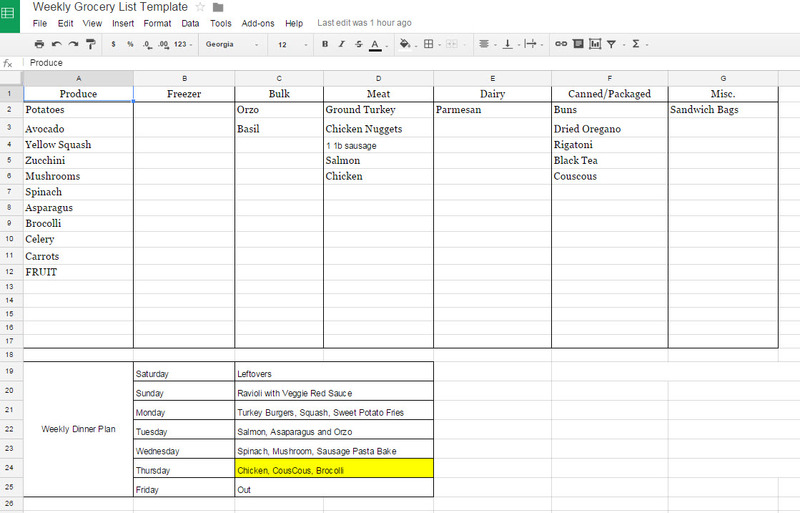 After a little research, I decided to create a Google doc that contained my dinner plan for one week and also my grocery list. I like to separate my grocery list my section of the grocery store (i.e. produce, dairy, meat, frozen, etc). Now I have everything on a one-page document that I can easily print each week to take with me to the store. I usually plan 5 meals, with one night for leftovers and one night for eating out. Each Saturday I sit down and plan out the week. This makes grocery shopping easy and stress-free… and it only happens once a week!